The opera Le donne curiose, based on a play by Goldoni, was Wolf-Ferrari's first big operatic success, and it set the path for his subsequent operas. Most were comedies based on Goldoni or Moliere, and most had their first successes in Germany. Le donne curiose was premiered in Munich, in German in 1903, getting its first performance in Italian in New York in 1912 at the Met with Toscanini conducting. 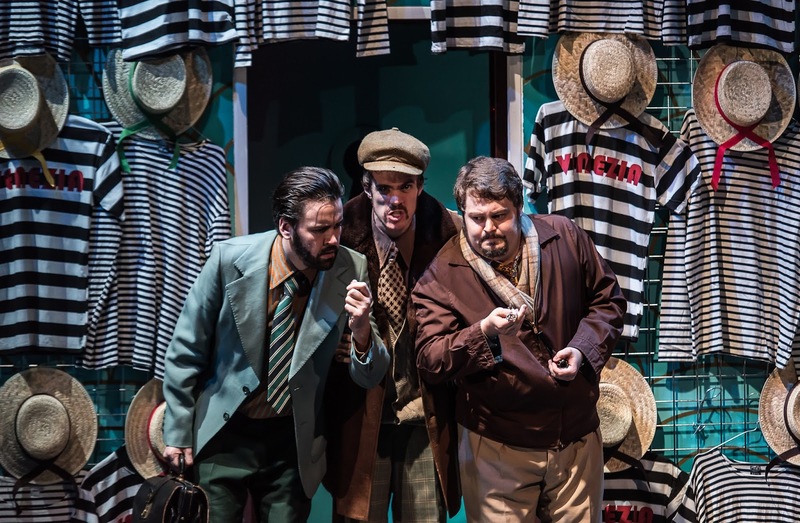 Despite familiarity on disc with Wolf-Ferrari's operas, Le donne curiose had not come my way in the theatre so the performances of the opera at the Guildhall School of Music and Drama provided a welcome opportunity to see the piece in the theatre. We caught the performance on Friday 6 November 2015. The production was directed by Stephen Barlow, with designs by Yannis Thavoris and lighting by Howard Hudson, and video by Dom Baker. The cast included Christopher Cull as Lelio, David Ireland as Ottavio, Thomas Atkins as Florindo, Bethan Langford as Beatrice, Nicola Said as Rosaura, Jennifer Witton as Eleonora, Katarzyna Balejko as Colombina, Josep-Ramon Olive as Pantalone, Milan Siljanov as Arlecchino with John Findon, Andrew Brown, James Robinson, Eduard Mas Bacardit, Lukasz Klimcak, Bertie Watson, Jack Holton, Chavdar Mazgalov, with Mark Shanahan conductor. The plot is relatively simple. The men meet regularly at a club, run by Pantalone (Josep-Ramon Olive), where women are not allowed. 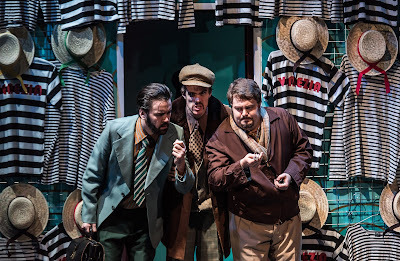 The married men, Lelio (Christopher Cull), Ottavio (David Ireland) and Florindo (Thomas Atkins) who is betrothed, deal with the women's curiosity in different ways. Whilst Leandro (John Findon), who is unmarried suggests that the best thing is to be unmarried and enjoy food. They decide to have a dinner that evening organised by Pantalone and his sidekick Arlecchino (Milan Siljanov). The rest of the opera concerns the schemes that the women have to learn what is in the club, each having their own fantasy about what goes on. 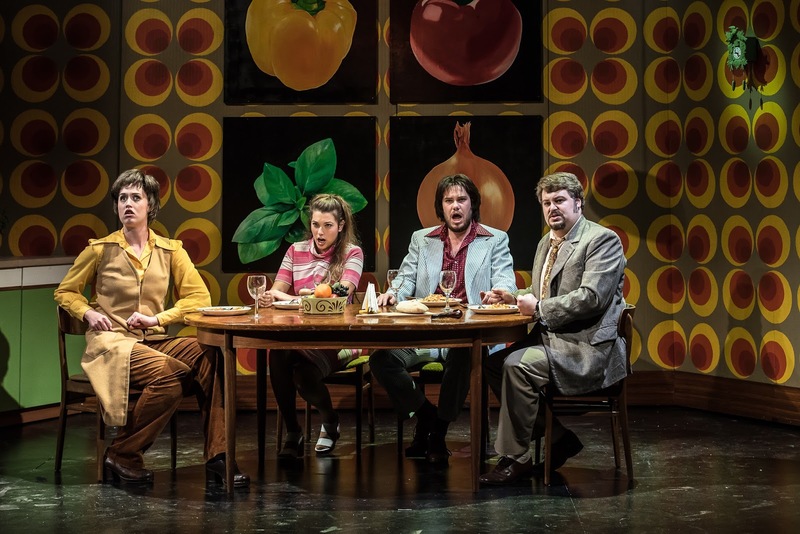 Being based on a Goldoni farce, there is much by-play with finding keys to the club and the women's curiosity gets the better of them so they fall into the club whilst the men are eating. It could all be a bit of a bore, with pseudo-18th century music pootling along endlessly. But not at all. Stephen Barlow drew performances of great verve from the young singers. Wolf-Ferrari's music keeps moving (the whole opera of three acts lasted from 7pm to 9.30pm with one interval). At first sight it sounds like a light, 20th century 18th century pastiche but look underneath and it is far more subtle. Wolf-Ferrari's style is eclectic and he weaves in hints of others, you could perhaps hear Verdi's Falstaff at various points, whilst the architecture of the work is post-Wagnerian even if the forces used are not. And the writing for the voices is lovely, with Wolf-Ferrari not being frightened of slowing things down for an aria. There was a ravishing love-duet for the young lovers, and the vocal writing in the ensembles was beautifully judged. Stephen Barlow and Yannis Thavoris set the piece in the 1960's, in the context of a period TV programme which excused the rather stylised nature of the plot. There was not attempt to make this naturalistic, Thavoris's huge patterned wallpapers prevented this, but not over mugging either. The cast seemed to be having great fun and this came over. Both Rosaura (Nicola Said) and Eleanora (Jennifer Witton) impressed in their solo moments, and this is not easy writing. Whilst Said paired finely with Thomas Atkins' ardent Florindo in a lovely love duet. 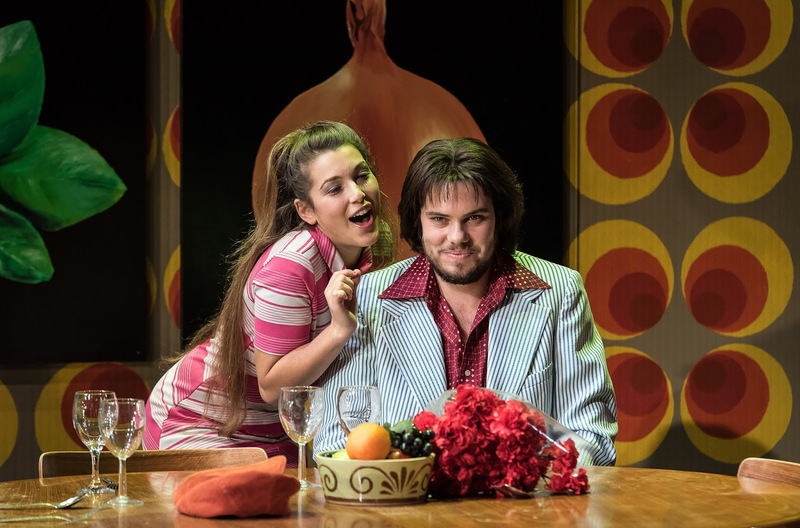 Colombina (Katarzyna Balejko) never quite gets an aria but as the partner of Arlecchino (Mian Siljanov) she is the engine of the female comic moments and Balejko was a complete delight especially when 'disguised' as a man in tracksuit with salami down her trousers! Rosaura's mother Beatrice (Bethan Langford) showed a rather dry sense of humour and a mean way with the pasta maker (the whole production was full of delightful naturalistic details; Rosaura and Florindo cement one of the arguments by washing up together). The leading male roles never get arias as such, but still a great deal of air time. David Ireland was wonderfully avuncular as Ottavio (Beatrice's husband), whilst Christopher Cull brought a slightly scary sexiness to Lelio who was rather too free with using his belt on his wife (at one point she hides in the wardrobe to escape him). Josep-Ramon Olive and Milan Siljanov had the time of their lives as the two main comic characters. Olive was wonderfully misogynistic as Pantalone (no wonder the opera was set in a period, it would be difficult to update completely) whilst Siljanov brought his black voice to great comic effect as Arlecchino. Under Mark Shanahan the orchestra made Wolf-Ferrari's score with its substantial overture and various entraces really sparkle.You could perhaps quibble about odd details but they got everything right in terms of style and feel. The same could be said for the whole production. In his note in the programme book, Dominic Wheeler (head of opera studies at the Guildhall School) talks about the work's combination of Italianate brilliance, musical sophistication, comedy and lyricism and these were the qualities which the performers brought out in the music. And Wheeler also added a home that the performance would help towards a re-evaluation of the work, and I certainly hope that it does.